I read David Hockney's book 'Secret Knowledge, Rediscovering The Lost Techniques of The Old Masters' when it originally came out back in 2001. I regularly use photographs as reference material and found Hockney's book absolutely fascinating. It describes how many of the old Masters used a camera obscura to project an image on to paper or canvas which the artist then traced over - just like photorealistic painters do today. There were glitches in the process though, particularly the very narrow depth of focus. I noticed this myself when I went to see the exhibition of Caravaggio paintings at the National Gallery in 2005. In his 'Supper at Emmaus' the disciple to the right of Jesus from our point of view has his arms out stretched and his hand furthest away is huge, beautifully painted but completely out of proportion. According to Hockney's book, Caravaggio almost certainly used a camera obscura and that's one reason why his paintings were so dark. It seemed to me that Caravaggio had adjusted the distance from his model to get the camera obscura to focus on the furthest hand and then lost the continuity with the rest of the model's body. 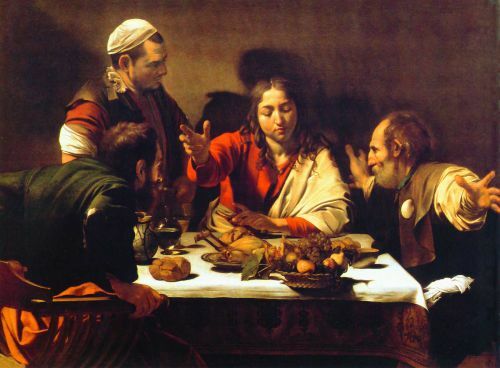 But I couldn't understand how Caravaggio had missed that mistake, it's so obvious in the finished painting. The size of the hand would be fine if it was up against the model's face but not at arm's length. No wonder he avoided painting backgrounds. I love Caravaggio's dark paintings with their theatrical lighting but I'm not at all keen on contemporary photorealism. I can't see the point. If you really like a photo then why not show it as a photo? If you want it on canvas even Kodak can do that. And tracing over a projected image is cheating. There's no skill in it. For me painting requires images to go in through the eye, loop through the brain and out through the hand/eye. Some warping of reality is to be welcomed, it adds a unique twist to the outcome. If you want a perfect painting get a photo printed on canvas. Even using photographic references can be a problem, especially if you slavishly try to copy every detail. I've found that paintings work best when at some point you let go of the photograph/s and allow the painting to take on a life of its own. Ditto working direct from nature. This is most important with colours and the unification of a picture through colour harmonies. In the photo everything is caught in the same light which should theoretically harmonise them, but try and reproduce that with direct paint and you will most likely come unstuck - so choose a harmonising colour similar but not identical to that in the photo (or the opposite if you have Fauve tendencies). At some point in the future I'll write another blog on harmonising colours and all the different ways to cheat.